I have a feeling what happened in Tunisia, and what is happening in Egypt will cast profound and long effects over Middle East. I’m no expert on this matter though. I also have a feeling the Euro zone has not solved the problem. They may have been successful in buying some time. Again, I’m no expert on this matter either. It seems to me that EURUSD has topped finally. I most likely short EURUSD in February. I will wait for .2. My target is 1.2440. As always, I leave the analysis on those news and columns to professionals, but my general feeling is that Euro zone bought some time before the mid term risk. Nothing really is resolved. I think the big rally against US dollar of the last week is reflecting the situation well. Here is my current Elliot wave count. 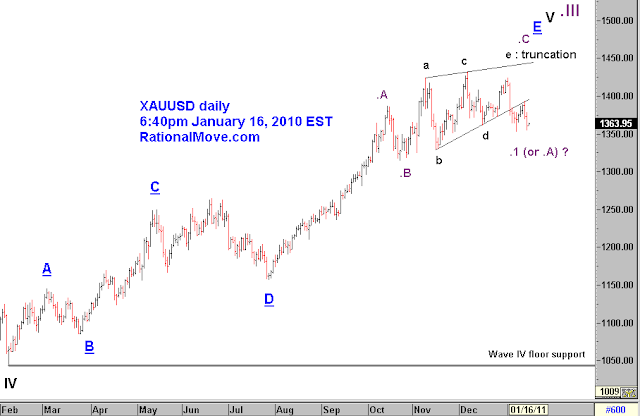 A minor tweak from the last post is that now I am proposing that Wave b is not over. Wave b is drawing a expanded flat as A-B-C. So I would never long EURUSD from here. Just wait for the sign of the initial descent to catch Wave C.
I imagine that move from the last December has been confusing many swing traders. They were rather for day trader’s movements and not my market to trade. I’m just waiting patiently for now. It’s been a while since I mentioned about gold. Wow, it’s been almost a year since my last bullish call on XAUUSD. I made some money by being long of gold in 2010, but I got cautious since it lost the characteristics of impulse wave though the price kept going higher and I was technically missing the opportunity. I’m still on the side of anticipating the mid term correction, and the lost momentum of the gold in the past weeks may be the sign of the beginning of it. I would still hold the temptation of going short of gold. What I’m aiming is the correction that is as big as going below $1200, and possibly to the Wave IV floor support in the chart below. I just need to take advantage of the fraction of the whole movement to make money. So, I just wait. Happy New Year 2011. The market conditions seem to be changing frequently, and I’m sure 2011 will be very different from 2010. Yet, I’m generally optimistic about the trading outcome just because I’m determined to be a disciplined trader this year, too. At the end of the last year, I predicted EURUSD to bounce up, and I was right except that the rebound actually was weaker and shorter. My prediction was above 1.36, and I was expecting the dollar to be under pressure longer in Q1. Good thing was I even did not have chance to long EURUSD which would have ended up losing money. 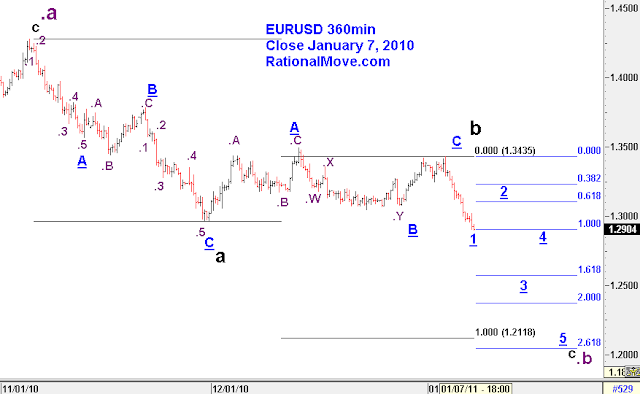 Another good thing is that the Elliott Wave count is still valid. 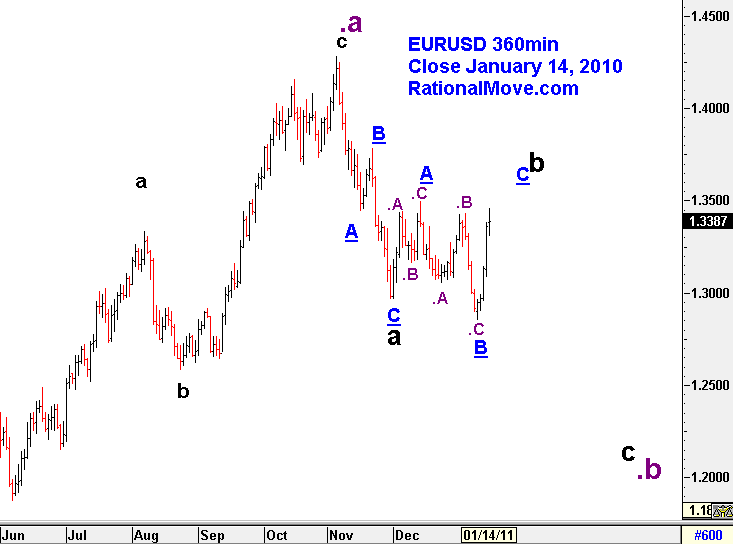 I believe EURUSD finished b wave, and started the initial descent (1) of c wave, which is also the conclusion of .b. 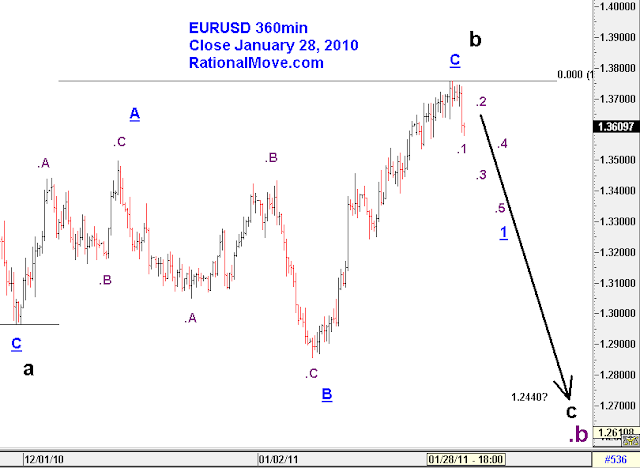 I will patiently wait for 2 wave before placing sell EURUSD order. The blue Fibonacci lines are based on the weak assumption 1 wave is over. Together with the projection of a wave’s travel length (black lines), I would expect EURUSD to descend below 1.22 in the mid term.